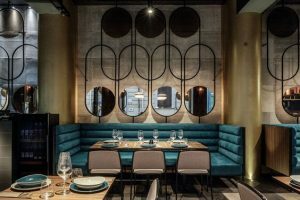 Where do you start when considering incorporating a feature wall within a commercial or hospitality scheme? When talking about feature walls, your immediate thoughts might be of powerful wall colours or the classic go-to; a wallpaper or wallcovering. If you’re looking for something different, we’ve compiled a few inspiring alternatives. If you want to give your client’s interior design scheme the ‘wow’ factor, here are some ideas. The age-old looking glass has earned high status as one of the most effective interior design tools. More than a trusty companion to help you get ready in the morning or used as a decorative piece over the mantlepiece, mirrors can create some of the most amazing statement walls. Available in a variety of shapes, styles and sizes to suit your space, mirrors provide an alternative to creating patterns and forms. They also offer the additional benefits of enhancing lighting and giving the illusion of a bigger space. A classic go-to design feature in order to create impact within a design scheme. The beauty of a gallery wall is that you can convey the theme of the design within the choice of artwork and how it is displayed. Black and white photographs in a grid pattern are a timeless classic for an elegant and sophisticated visual arrangement. 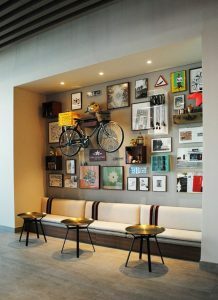 However, a mishmash collection of objects can create a quirky, fun and intriguing feature wall. Biophilic design is becoming ever more important to fit in with our modern-day lives. Incorporating direct or indirect elements of nature into the built environment can reduce stress whilst increasing wellbeing. 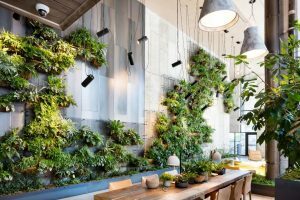 It is no wonder that biophilic elements such as living or green walls are becoming more integrated into commercial and hospitality design. These wonderful eco-structures not only provide a sense of calmness and closeness to nature but, in addition, showcase an array of organic forms and colours that suit any interior scheme. They can also improve the air quality in your interior environment. Read more about biophilic design here. Now, panelling is making a comeback in modern day form using modern geometric and linear shapes creating subtle relief surface patterns. 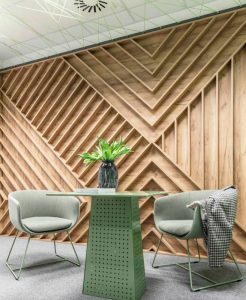 Wall panelling does not have to be limited to one material such as wood. Create statement walls with concrete panels with embedded brass beading or even use textiles such as decorative leather for a classic and stylish look. 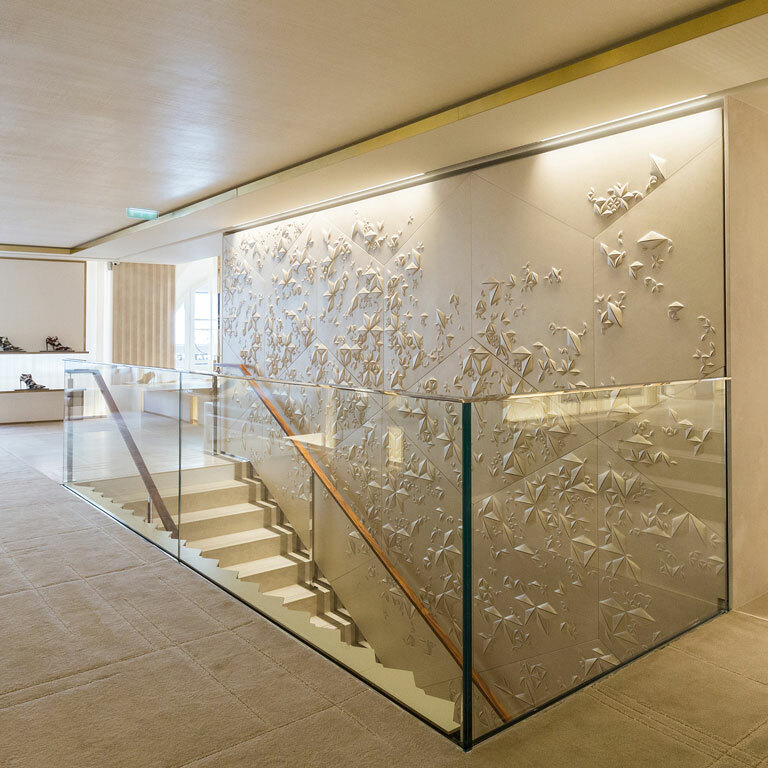 The use of wall lighting within an interior does not have to be limited to a functional element. By using lighting as a feature, you can generate soft and atmospheric mood lighting. You can also create impactful visual forms through the pattern of light and decorative structural designs. Lighting can bring cohesion to a scheme as well as creating some fantastic features in areas where you least expect it. 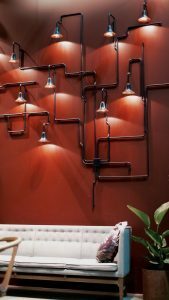 Here are some great statement lights you should consider. 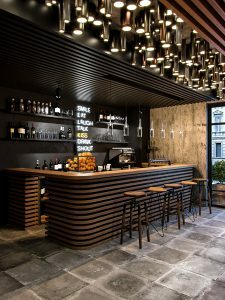 Want great interior design advice for your commercial or hospitality space? Email interiors@diversity.agency or call us on (0115) 967 3767.